I will offer some reflections on this. It is not quite true to say that there was no previous evidence of gravitational waves, because their presence had been inferred with reasonable confidence from the behaviour of a binary neutron star system called the Hulse-Taylor pulsar. However, this previous work did not detect the waves themselves; rather, the rate of loss of energy in the system was deduced from observations of the timing of the orbit, and the expected rate of loss of energy was calculated from the theory of General Relativity, and the two agreed. The new observation is very different. This time, an oscillation in spacetime passed across planet Earth and was directly detected by two large instruments in America. The scale of this achievement can be measured in various ways. The oscillation that was detected was one which moved a pair of mirrors through distances much smaller than the size of an atomic nucleus. To any scientist, this is mind-boggling, because the atomic nucleus is so small that one cannot imagine an instrument sensitive enough to detect such a motion. One cannot, that is, unless one undertakes a decades-long planning and implementation program to show that it can be done. In this case the mirrors are used to reflect laser beams which bounce many times between them, enhancing the signal, and the mirrors are scrupulously protected from other sources of vibration. Each mirror hangs inside a large cylinder which in turns hangs from a platform which in turn is supported by a four-layer stack of springs, masses and dampers, and the whole is held in vacuum. To estimate the background noise, one has to allow for things like rabbits running around on the ground near the detector (each detector itself has two arms, each four kilometres long) as well as ground vibrations owing to waves on the sea many miles away. Also, the solid materials of the supports for the mirror emit very weak ‘creaks’ and ‘groans’ owing to their thermal behaviour. Even after allowing for all this careful design and construction, I think most scientists would have been more cautious about the recent announcement except for a very striking and convincing fact. 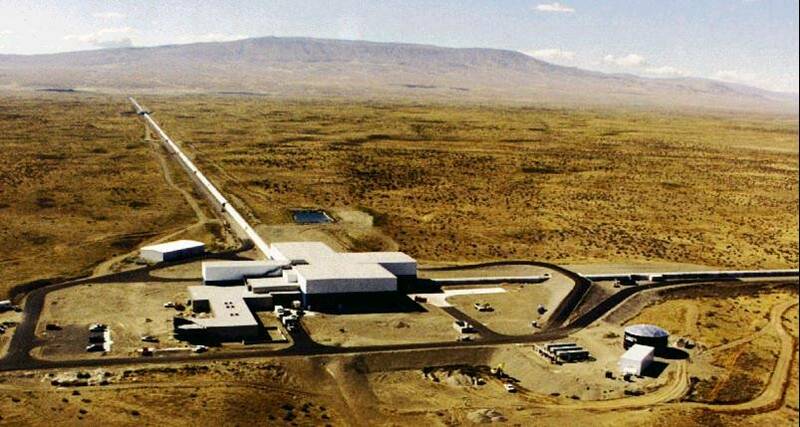 Not just one but two of these huge interferometer devices was made, at opposite ends of America, and BOTH showed the same signal (with just the right delay of 10 milliseconds for the signal to propagate between them at the speed of light). It is very unlikely that both suffered from the same spurious effect at the same time, so the most likely explanation is a wave that passed over both of them. And, given all the candidates (and, believe me, physicists think this through very carefully indeed) a gravitational wave is the most likely explanation. This image will surely now enter into the annals of science. It will become one of the iconic images of physics. Given this wonderful signal, the people working on the project were not in any doubt that something had happened (i.e. not just a noisy ‘blip’), but they needed time to carry out as many checks as they could think of to rule out other influences, and to determine what could be inferred from the signal. That is what they were doing between September 14 2015 09:05:45 UTC when the signal arrived, and 21 January 2016 when they sent their data and interpretation to Physical Review Letters for publication. It turns out that quite a lot can be determined from those ten or so oscillations. You have quite a lot to work with there: the basic frequency, and also the way the frequency changes over time, and the way the amplitude changes as the frequency does. I am not expert enough to know how to do the calculation (more specifically, how to program a computer to do it) but I am willing to trust that it has been done correctly. The conclusion is that two black holes spiraled around and into each other, throwing off about three Suns-worth of mass-energy in the form of gravitational waves as they did so. The dynamics of the signal imply that the black holes had masses of about 36 and 29 solar masses respectively. The distance away from Earth at which this event happened can also be inferred from the amplitude of the signal. The researchers report 410 mega-parsec. The nearest galaxies to our own are at a distance thousands of times smaller than this, so we may infer that the event occurred a long time ago in a galaxy far, far away. I am thrilled that so much can be determined from this event, and indeed more will come as further analyses are done. I am also encouraged that all the painstaking efforts taken by a large number of people should have been rewarded in this way. It is like a smile coming from the cosmos; a good news story that we need in these troubling times of political and religious unrest. 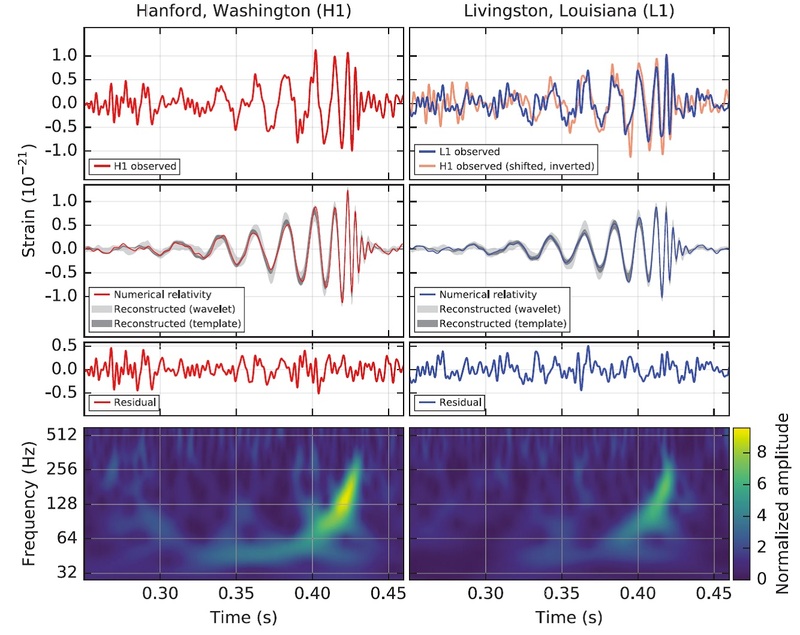 It so happens that in the weeks leading up to this announcement, I was myself learning about the LIGO instruments because I needed to understand how scientific experiments can be protected from seismic noise, and I knew that LIGO had the best protection currently known. Many humble researchers in laboratories across Europe and America have tested out ideas and built test rigs and performed numerical calculations to get the systems to the required level of stability. Most of their names will never be widely known. They are like the builders that put the stones into the cathedrals of Europe in the medieval period. They contributed to a larger project that represents the creative efforts of a community. The scientific team chose Physical Review Letters as the place of their publication. This is an affirmation by them of the editorial standards of that journal. I also found it note-worthy and heartening that the editors, and the American Physical Society, chose to make the paper immediately freely available to everyone. There was their way of extending an open hand to all people everywhere who take an interest in science. For this moment, questions of money were set aside. And for this reason, this is also the moment just to celebrate the science for what it is. I will not be drawing any religious lessons, nor countering anti-religious ones. I am very happy that, in some parts of the world at least, science, and the collaboration that it requires, can prosper in peace, and I salute all the skilled and careful people who brought this ambitious project to birth. This is a very useful and interesting summary for us non-physicists. Biologists, especially those who study DNA sequences, can naturally be struck by the similarities between our species and our close evolutionary relatives. But this story – the staggering sensitivity of the instruments and the astonishing conclusions which can be made from the data – reveals an enormous gulf between us and other primates which we also have to reckon with. Thanks for this, Andrew. I’m actually going to get the graph framed.